Shenmue series boss Yu Suzuki recently attended the Reboot Develop 2019 event held in Dubrovnik, Croatia, and showcased a handful of new screenshots for Shenmue III. This set of images shows Ryo in a harbor area of Chobu, showcasing the prize exchange area and pawn shop. Ryo can earn tokens by completing various games, and can then trade tokens for prizes, which can then be sold for cash. 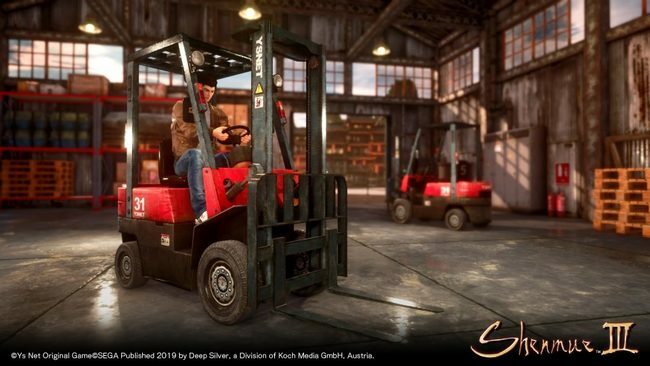 One of the jobs Ryo can take uses the forklift, which has become somewhat iconic for the Shenmue franchise. We got to see a guided 15-minute tour of Shenmue III last month, where we saw a mix of RPG and adventure mechanics. Shenmue III is set to release on August 27 for PlayStation 4 and PC.